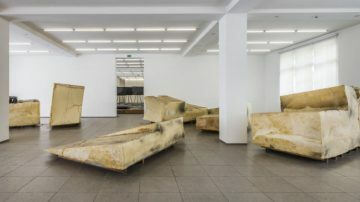 In 2019, temporary exhibitions in Berlin’s Hamburger Bahnhof – Museum für Gegenwart include solo retrospectives of Jack Whitten, Otto Mueller and Emil Nolde. 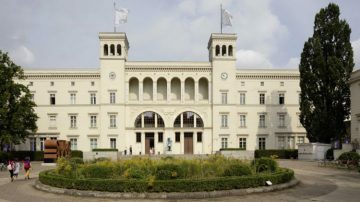 The Hamburger Bahnhof – Museum für Gegenwart is the leading museum of contemporary art in Berlin. As the Museum for the Present, it houses the large collection of post-1960 art of the SMB National Gallery (Nationalgalerie). The museum’s vast selection of artworks is mostly displayed in rotating temporary exhibitions that are often enhanced by loan objects from other collections. Tickets for the Hamburger Bahnhof complex is usually €14 – some temporary exhibitions may be seen separately. Buy tickets online in advance from Tiqets. See also Top Temporary Art Exhibitions in Berlin in 2019 for pre-20th century art exhibitions in the other national galleries. This collaborative and trans-disciplinary project originated from conversations between Antje Majewski and Issa Samb but several further artists are involved. It centers on the interaction between the various artists and endangered places, societies and environments. The exhibition includes videos, large-scale installations, sculptures, manifestos, poems, photographs, drawings, and paintings. “The Elephant in the Room – Sculptures of the Marx Collection and of the Collection of the Nationalgalerie” uses works by Absalon, Joseph Beuys, Donald Judd, Jeff Koons, Rachel Whitebread and others to address the spatial effect of sculptures. This is the first institutional exhibition in Germany by the US artist Sam Pulitzer, who continues to be critical of institutions. It juxtaposed Pulitzer’s art with works by other artists such as Daniel Buren, Hans-Peter Feldmann, Mona Hatoum, Jenny Holzer, Jonathan Horowitz, Gülsün Karamustafa, Bruce Nauman, Raymond Pettibon, Gregor Schneider, and Roman Signer. The exhibition “Painter. Mentor. Magician. Otto Mueller and his Network in Breslau” focuses on the former Brücke painter Otto Mueller (1874-1930) and particularly the influence of his networking experience while teaching at the State Academy of Arts and Crafts in Breslau (Wroclaw) during the 1920s. 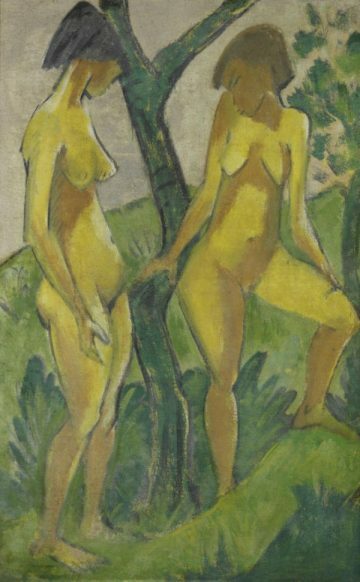 The exhibition also includes paintings by Polish Expressionists to highlight similarities and differences between a German and Polish experience of the same epoch and events. The Otto Mueller exhibition will travel to the National Museum in Wroclaw from April to June 2019. This exhibition is a multichannel video installation by the Polish-born but Berlin-based artist Agnieszka Polska. It takes 15th-century letters as point of departure and fuses Christian theological ideas with modern concerns regarding consumption, the environment and artificial intelligence. Agnieszka Polska was the 2017 winner of the prestigious Preis der Nationalgalerie – see below. 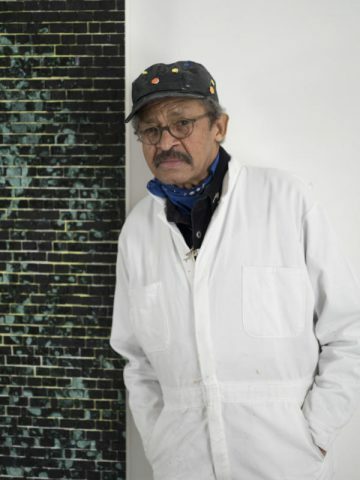 “Jack Whitten: Jack’s Jacks” is the first institutional solo exhibition in Europe of works by American artist Jack Whitten (1939-2018). The presentation, conceived in close collaboration with the artist, reveals how Whitten consistently redefined the boundaries of abstract painting over a period of six decades. Proceeding from his gestural paintings created under the influence of Abstract Expressionism, the exhibition traces the development of Whitten’s art from his slab paintings of the 1970s to his later experiments with structure and materiality that culminated in his own distinctive mosaic style. To illuminate the contemporary context of the works, the exhibition focuses on paintings dealing with historical events and prominent personalities such as Martin Luther King, Barack Obama, Andy Warhol, John Coltrane and Prince. 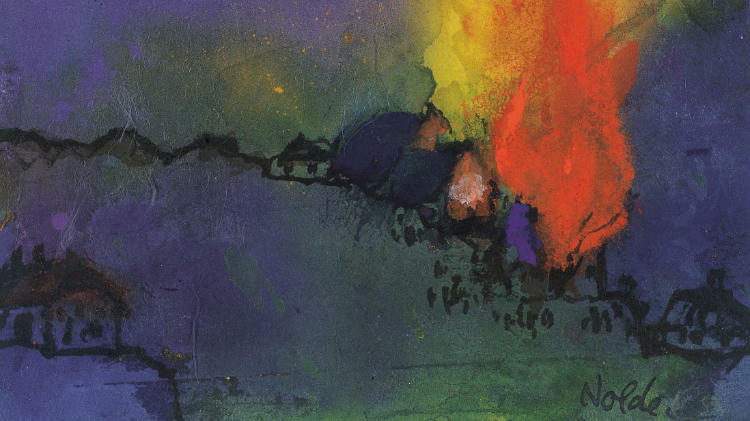 Emil Nolde (1867-1956) is one of the most important and well-known German Modernist artists. 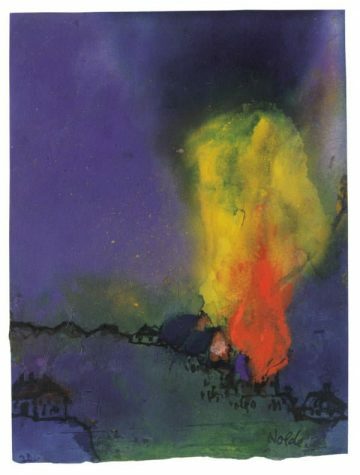 The most prominent victim of the Nazi’s art and cultural policy, Nolde celebrated numerous triumphs in the German art world after 1945, not least with his renowned ‘unpainted pictures’. However, insiders knew early on of his sympathy for Hitler and the National Socialist regime and numerous letters he wrote in an attempt to get the prohibition on his works lifted. “Emil Nolde – Eine deutsche Legende. Der Künstler im Nationalsozialismus” is a cooperation between the Nolde Stiftung Seebüll and the Nationalgalerie to present the first comprehensive exhibition on this topic, with over 100 works, some of which have never been shown before. Andreas Mühe (b. 1979 in Chemnitz) became internationally known through his examination of the German past and identity. His photographs, produced entirely with analogue technology, are often marked by ambivalence; an almost gloomy overtone, which points to the no longer visible but still perceptible consequences of German historiography. The carefully composed images suggest a certain kinship to theatre and staging. 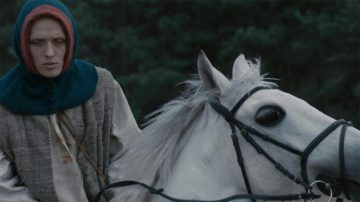 The proximity to acting, theatre and film can be inferred in part from his personal biography: his father was the well-known actor Ulrich Mühe; his mother is the renowned theatre director Annegret Hahn. These two personalities, along with other relatives, represent the protagonists in his new series of works conceived for an exhibition at Hamburger Bahnhof – Museum für Gegenwart – Berlin. In two large-scale photographic family portraits Mühe brings together living and no longer living members of his family. 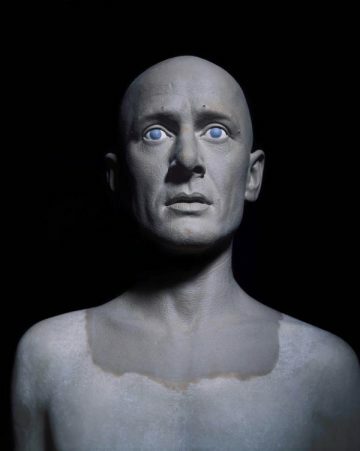 Working from photographs, he used a complex and laborious production process to have deceased family members replicated as strikingly lifelike sculptures. Magical Soup (currently the working title) unites media artworks and installations from the Nationalgalerie collection, the Friedrich Christian Flick collection at Hamburger Bahnhof and selected loans with loans. Songs, composers and music styles play a role in these works dating from the 1970s to the present. Music and sounds, like literature and language, are seemingly immaterial forms meant to occupy spaces to interweave reality and desire, landscape and body, geography and social structures. This common starting point poses the question of how action within a social environment defines spaces and boundaries. In autumn 2019 the Preis der Nationalgalerie will be awarded for the tenth time. Every two years, four artists – under the age of 40, who live and work in Germany – are nominated and their works are presented in a shortlist exhibition. The Preis der Nationalgalerie supports important young positions in contemporary art that reflect the internationality and vibrancy of the art scene in Germany. 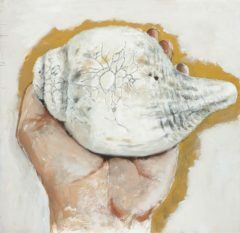 These artists have already achieved some recognition through their use of new artistic approaches. 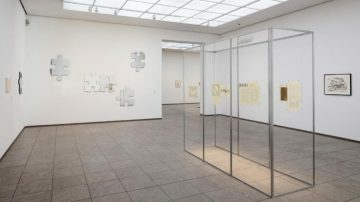 In 2013 the award changed from a financial prize to a curated solo exhibition that takes place the following year at one of the Nationalgalerie’s locations and is accompanied by a publication. Previous award winners: Agnieszka Polska (2017), Anne Imhof (2015), Mariana Castillo Deball (2013), Cypr-en Gaillard (2011), Omer Fast (2009), Ceal Floyer (2007), Monica Bonvicini (2005), Elmgreen & Dragset (2002), Dirk Skreber (2000). The Hamburger Bahnhof is open Tuesday to Sunday, opening at 10:00 in the week but only at 11:00 on weekends. Closing time is 18:00 but 20:00 on Thursdays. Admission is €14 (€7 for students) for the whole complex but some temporary exhibitions may be seen separately, usually for around €8. Admission is free for children under 18 but get a free ticket online too to save time. Tickets are available online from the museum, or simpler from Tiqets. The Museum Pass Berlin is valid and a very good deal – 30 museums in three days for €29.